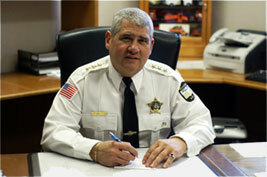 As Director of the Melrose Park Police Department, it is my pleasure to welcome you to our website. Whether you are a resident of Melrose Park, a business owner, someone who is planning to visit, or a cyberspace explorer, I trust that you will find something of interest within these pages on how the Melrose Park Police Department serves this community. The Police Department strives to keep pace with emerging programs and methods that will help us maintain a high quality of life in Melrose Park. We believe by working in partnership with the community we can create a community where residents and visitors can work, play, and relax in a safe environment. Crime is a community concern, and in Melrose Park we have created a public/private partnership to reduce crime. It is the mission of the Melrose Park Police Department to safeguard the lives and property of the people we serve, to reduce the incidents and fear of crime, and improve the quality of life for the residents of the village by working in partnership with the community while respecting the Constitutional Rights of all persons.